In recent years, worldwide tablet shipments have declined, one of the causes for this being the fact that many smartphones now offer giant screens of around 6 inches, or even more - so customers can buy a single device that kind of acts like a phone and a tablet at the same time. Nevertheless, there's still a pretty healthy demand for traditional tablets, especially since plenty of slates are now very affordable. In case you're looking for the best affordable tablets that can be bought right now in the US, we've prepared a list that you'll hopefully find useful.Check it out below - tablets are listed from the smallest and cheapest model to the largest (and most expensive) one. Far from sharing the fate of the Fire Phone (which was a complete flop, even after multiple price cuts), Amazon's Fire tablets have been successful from the very first model (released in 2011 under the Kindle Fire name). The latest Amazon Fire tablet - launched in September last year - is being sold for the incredibly low price of $49.99, and, unsurprisingly, it's a hit. Of course, this is a low-end tablet, and one that's not particularly pretty, but 50 bucks is definitely not a lot of money for what it's offering - including a 7-inch display with 600 x 1024 pixels, Wi-Fi, a quad-core CPU, 1 GB of RAM, and 8 GB of expandable storage space. For just $10 more, you can buy an Amazon Fire slate with 16 GB of storage space. Both the 8 GB and 16 GB variants run Amazon's own forked version of Android (Fire OS 5). As its name clearly suggests, the Alcatel Pop 7 LTE offers 4G LTE connectivity, and it's one of the cheapest tablets to do so. T-Mobile is currently offering the Alcatel Pop 7 LTE for $129.99 outright, or $5.42 per month for 24 months. The slate surprisingly runs Android 6.0 Marshmallow out of the box, though the rest of its features (besides LTE) are hardly impressive: 7-inch display with 600 x 1024 pixels, quad-core processor, 1 GB of RAM, 5 MP and 2 MP cameras (rear and front), and 8 GB of expandable internal memory. 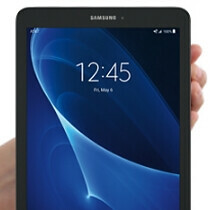 The Galaxy Tab E 8.0 is one of Samsung's new tablets of 2016, and it can already be ordered via most carriers in the US, including Verizon, AT&T, Sprint, and US Cellular. Sporting an 8-inch display with 800 x 1280 pixels, the Galaxy Tab E 8.0 is powered by a quad-core 1.3 GHz processor, and comes with LTE connectivity. It's also got 5MP (rear) and 2 MP (front) cameras, 1.5 GB of RAM, 16 GB of expandable storage space, and a generous 5,000 mAh battery. Unfortunately, the slate still runs Android 5.1 Lollipop. If you want to buy the Samsung Galaxy Tab E 8.0 at the lowest price available, AT&T is the place to go to: the carrier is asking $10 per month for 20 months, or $200 outright for the tablet. Finally, here we have the largest tablet on our list: the LG G Pad II 10.1, which is also the most powerful, and most expensive slate from those that we're presenting here. This G Pad II offers a 10.1-inch IPS display with 1200 x 1920 pixels, and is powered by a quad-core Snapdragon 800 processor (which was once used in high-end, flagship smartphones and tablets). There's 2 GB of RAM on board, in addition to 16 GB of storage space, microSD card support, and a 7400 mAh battery. The LG G Pad II 10.1 runs Android Lollipop, but should be updated to Marshmallow at some point. You can get the G Pad II 10.1 (non-LTE model) from Amazon for $299.99. You own an ugly outdated piece of garbage? Is that what you are trying to tell us? How is the Nvidia Shield Tablet K1 not on this list? It destroys everything on this list and only costs $199. I feel like this is a poorly constructed list. There are less expensive tablets than these available for purchase with similar/better specs. Do PA research these articles at all? Too many better tablets in this category missing. The Asus Zenpad S 8.0 should be on this list as well.